The 128 support is not as rock solid as for the 64, but it's getting there. If you aren't running REUs I think it's fine as the 1541 emulator (which is what I use it for the most on my 64). This article about an in development RAM expansion for the 64/128 by Jim Brain might be of interest. This was posted last year but there has been no update since. Still, it sounds cool and I may ping Jim Brain to see if it is still ongoing. I found an REU from a guy in Canada,and bought it and a Aprotek expander for $100 plus shipping! I am looking forward to getting it next week. intric8 wrote: This leaves me with a few questions. 1. Should I de-solder the plugged holes and solder in a socket for a function ROM? I wouldn't ever want to solder in a function ROM as there'd be no way to disable it. If I installed a socket for a function ROM, would I need to remove a section of the heat shield for it to fit? 2. And look at that area above the ROM bay. It looks like it's made for a jumper - for adding an on/off switch, perhaps? Does anyone reading this know if that's for enabling/disabling the function ROM when it is installed? I found the schematics if you're skilled in reading those. If the jumper area you are referring to is the one labeled J2, then it is not for enabling/disabling the ROM, but for selecting the size, either 16Kbyte or 32K. Ah - thank you for that information, BertyFromDK! Zippy Zapp wrote: No, that's cool, I thought you might have had one already. Yeah, I wouldn't open it again unless I had to either as those plastics get brittle too. 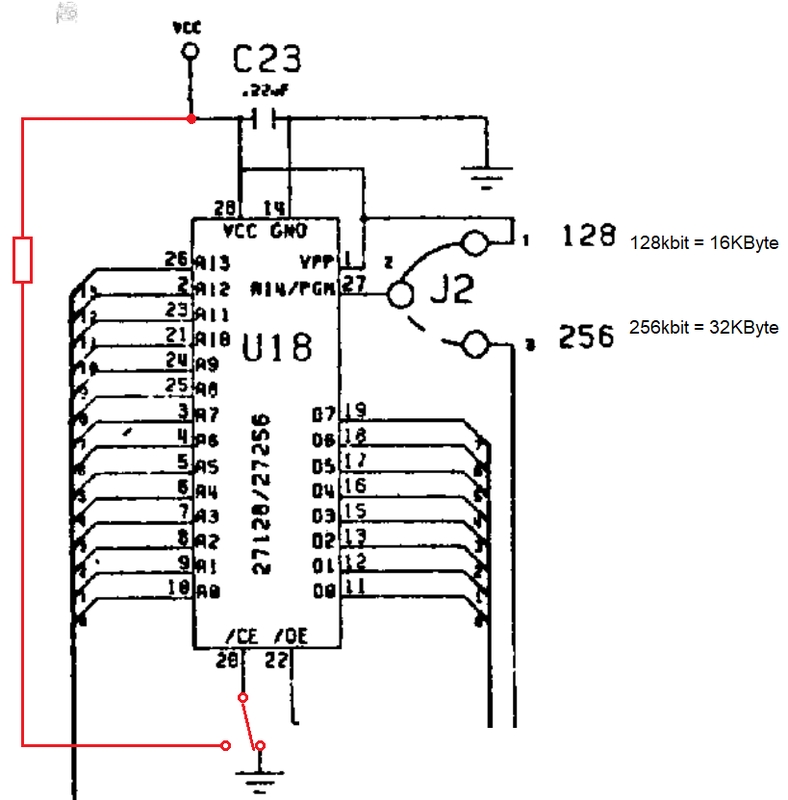 The resistor is on the schematics I was just curious if they actually put it in or if all of them, even the C128 versions, are left off. I have heard of people using the 1764 on a 128 with no problems so it was just a curiosity. I am using a 1764 on my C128, and it is even on an expansion board with four slots, one being shared with my 64NIC+ - I have had no issues, and GEOS recognizes and uses the RAM with no apparent problems. I really like the extra 256K in GEOS on my board - it makes reboots a very fast thing. Cool! Thanks for the info. Have you thought about upgrading the 1764 to 512k? I know you can go higher to I think 2MB, but to 512k is super easy as it just requires soldering in some DRAM. I updated one of mine and it works good. I am not sure to do with the 256k that is in there! I suppose that when I start playing with video playback from the REU I will want to upgrade it. Dynamic_Computing wrote: I am not sure to do with the 256k that is in there! I suppose that when I start playing with video playback from the REU I will want to upgrade it. I hear ya, I probably don't have a need for it at this time, although GEOS and Maverick make use of it and is especially helpful for duplicating 1581 disks with only 2 swaps. I upgraded mine back in the 80's because I ran a Color64 BBS in my city and it enabled me to store all the overlays and BBS games in memory so that there was zero disk access. It was a long bootup as everything from a couple of disks was copied into RAM but it was such a huge helper. I still have the BBS and all the files as it was in 1989 but I haven't had to time to see if I can boot it up since it was sort of a semi-complicated configuration at the time with 1764, 1581, 1571, 1541C, 1541-II all in use at the same time.